The Blood Sciences Department (comprising of Clinical Biochemistry and Haematology/Blood Transfusion) are looking to appoint a suitably qualified, experienced and HCPC registered Biomedical Scientists, to assist with the provision of a diagnostic service and support the delivery of a 24 hour per day, 7 days per week service as part of an average 37.5 hour working week - including evenings, nights, weekends and Bank/Public holidays. 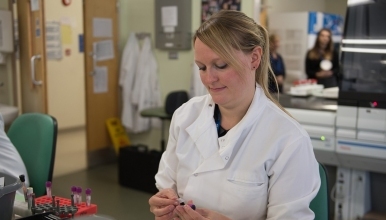 Applications are invited from HCPC registered Biomedical Scientists, with at least 24 months post registration experience in Biochemistry or Haematology & Blood Transfusion. Cross-disciplinary skills within Blood Science and experience of working out of hours would be advantageous. Candidates working towards HCPC registration will also be considered. The successful candidate will be based at The Princess Royal Hospital, Telford. Candidates will be expected to train in Biochemistry, Haematology and Blood Transfusion and to rotate through all sections of the department. Staff may be required to work on any of our other sites, as the need arises. The successful candidate(s) will be required to commit to cross-disciplinary training. The Biochemistry section is equipped with Roche Cobas 6000 analysers and Roche pre-analytics and middleware. The Haematology section is equipped with a Sysmex XN and CS2500 analysers. IH1000 and Biorad Gelstations are in use on our Blood Transfusion Department. The department has full accreditation and is an approved IBMS/HCPC training laboratory. Continuous professional development is actively encouraged. Telford & Wrekin is small urban borough. The majority of the borough’s 160,000 people live in Telford, which comprises several older towns such as Wellington, Ironbridge and Oakengates alongside newer residential areas. Telford is a major business centre and boasts 140 overseas companies. The borough also includes rural areas such as the Wrekin and the market town of Newport on the border with Staffordshire. Shrewsbury is set amidst glorious countryside near to the Welsh Borders, and is one of England's finest medieval market towns. The town centre is packed with timber-framed black & white buildings, steep narrow streets and alleyways. The River Severn forms a loop around the town centre offering gentle riverside walks. Shropshire provides a suburb location in which to work and live. There is ample opportunity to participate in outdoor activities including walking and cycling in the surrounding Shropshire countryside. There are also good motorway and rail links to Birmingham, Manchester and Liverpool.